Pantoprazole 40 mg, powder for solution for injection. Each vial contains 5.0 mg of sodium citrate dihydrate and sodium hydroxide q.s. This medicinal product contains less than 1 mmol sodium (23 mg) per vial, i.e. is essentially “sodium free”. White or almost white, uniform porous cake. – Zollinger – Ellison Syndrome and other pathological hypersecretory conditions. This medicine should be administered by a healthcare professional and under appropriate medical supervision. The intravenous administration of pantoprazole is recommended only if oral application is not appropriate. Data are available on intravenous use for up to 7 days. Therefore as soon as oral therapy is possible, treatment with pantoprazole i.v. should be discontinued and 40 mg pantoprazole p.o. should be administered instead. 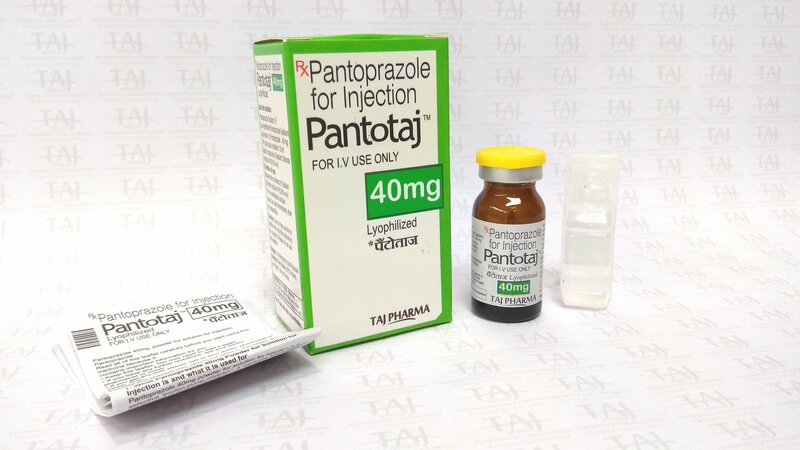 The recommended intravenous dose is one vial of pantoprazole (40 mg) per day. For the long-term management of Zollinger-Ellison Syndrome and other pathological hypersecretory conditions patients should start their treatment with a daily dose of 80 mg of pantoprazole i.v. Thereafter, the dosage can be titrated up or down as needed using measurements of gastric acid secretion to guide. With doses above 80 mg daily, the dose should be divided and given twice daily. A temporary increase of the dosage above 160 mg pantoprazole is possible but should not be applied longer than required for adequate acid control. In case a rapid acid control is required, a starting dose of 2 x 80 mg of pantoprazole i.v. is sufficient to manage a decrease of acid output into the target range (<10 mEq/h) within one hour in the majority of patients. The experience in children is limited. Therefore, pantoprazole i.v. is not recommended for use in patients below 18 years of age until further data become available. A daily dose of 20 mg pantoprazole (half a vial of 40 mg pantoprazole) should not be exceeded in patients with severe liver impairment (see section 4.4). A ready-to-use solution is prepared in 10 ml of sodium chloride 9 mg/ml (0.9%) solution for injection. For instructions for preparation see section 6.6. The prepared solution may be administered directly or may be administered after mixing it with 100 ml of 9 mg/ml (0.9%) sodium chloride injection, or 50 mg/ml glucose (5% ) solution for injection. After preparation the solution must be used within 12 hours (see section 6.3). The medicinal product should be administered intravenously over 2 – 15 minutes. Hypersensitivity to the active substance, substituted benzimidazoles, or to any of the excipients listed in section 6.1. In the presence of any alarm symptom (e. g. significant unintentional weight loss, recurrent vomiting, dysphagia, haematemesis, anaemia or melaena) and when gastric ulcer is suspected or present, malignancy should be excluded, as treatment with pantoprazole may alleviate symptoms and delay diagnosis. Further investigation is to be considered if symptoms persist despite adequate treatment. In patients with severe liver impairment, the liver enzymes should be monitored during therapy. In the case of a rise in the liver enzymes, the treatment should be discontinued (seesection 4.2). Co-administration of atazanavir with proton pump inhibitors is not recommended (see section 4.5). If the combination of atazanavir with a proton pump inhibitor is judged unavoidable, close clinical monitoring (e.g. virus load) is recommended in combination with an increase in the dose of atazanavir to 400 mg with 100 mg of ritonavir. A pantoprazole dose of 20 mg per day should not be exceeded. Pantoprazole, like all proton pump inhibitors (PPIs), might be expected to increase the counts of bacteria normally present in the upper gastrointestinal tract. Treatment with pantoprazole may lead to a slightly increased risk of gastrointestinal infections caused by bacteria (e.g. Salmonella and Campylobacter and C.difficile). Proton pump inhibitors are associated with very infrequent cases of SCLE. If lesions occur, especially in sun-exposed areas of the skin, and if accompanied by arthralgia, the patient should seek medical help promptly and the health care professional should consider stopping Pantoprazole. SCLE after previous treatment with a proton pump inhibitor may increase the risk of SCLE with other proton pump inhibitors. Increased Chromogranin A (CgA) level may interfere with investigations for neuroendocrine tumours. To avoid this interference, Pantoprazole 40 mg, powder for solution for injection treatment should be stopped for at least 5 days before CgA measurements (see section 5.1). If CgA and gastrin levels have not returned to reference range after initial measurement, measurements should be repeated 14 days after cessation of proton pump inhibitor treatment. This medicinal product contains less than 1 mmol (23 mg) sodium per dose, i.e. essentially “sodium-free”. Because of profound and long lasting inhibition of gastric acid secretion, pantoprazole may reduce the absorption of drugs with a gastric pH dependant bioavailability, e.g. some azole antifungals such as ketoconazole, itraconazole, posaconazole and other medicines such as erlotinib. Co-administration of atazanavir and other HIV medications whose absorption is pH-dependent with proton pump inhibitors might result in a substantial reduction in the bioavailability of these HIV medications and might impact the efficacy of these medicines. Therefore, the co-administration of proton pump inhibitors with atazanavir is not recommended (see section 4.4). Although no interaction during concomitant administration of phenprocoumon or warfarin has been observed in clinical pharmacokinetic studies, a few isolated cases of changes in International Normalised Ratio (INR) have been reported during concomitant treatment in the post-marketing period. Therefore, in patients treated with coumarin anticoagulants (e.g. phenprocoumon or warfarin), monitoring of prothrombin time/INR is recommended after initiation, termination or during irregular use of pantoprazole. Concomitant use of high dose methotrexate (e.g. 300 mg) and proton-pump inhibitors has been reported to increase methotrexate levels in some patients. Therefore in settings where high-dose methotrexate is used, for example cancer and psoriasis, a temporary withdrawal of pantoprazole may need to be considered. Pantoprazole is extensively metabolised in the liver via the cytochrome P450 enzyme system. The main metabolic pathway is demethylation by CYP2C19 and other metabolic pathways include oxidation by CYP3A4. Interaction studies with drugs also metabolised with these pathways, like carbamazepine, diazepam, glibenclamide, nifedipine and an oral contraceptive containing levonorgestrel and ethinyl oestradiol did not reveal clinically significant interactions. Results from a range of interaction studies demonstrate that pantoprazole does not effect the metabolism of active substances metabolised by CYP1A2 (such as caffeine, theophylline), CYP2C9 (such as piroxicam, diclofenac, naproxen), CYP2D6 (such as metoprolol), CYP2E1 (such as ethanol) or does not interfere with p-glycoprotein related absorption of digoxin. There were no interactions with concomitantly administered antacids. Interaction studies have also been performed administering pantoprazole concomitantly with the respective antibiotics (clarithromycin, metronidazole, amoxicillin). No clinically relevant interactions were found. There are no adequate data from the use of pantoprazole in pregnant women. Studies in animals have shown reproductive toxicity (see section 5.3). The potential risk for humans is unknown. Pantoprazole should not be used during pregnancy unless clearly necessary. Animal studies have shown excretion of pantoprazole in breast milk. Excretion into human milk has been reported. Therefore a decision on whether to continue/discontinue breast-feeding or to continue/discontinue therapy with pantoprazole should be made taking into account the benefit of breast-feeding to the child and the benefit of pantoprazole therapy to women. Adverse drug reactions such as dizziness and visual disturbances may occur (see section 4.8). If affected, patients should not drive or operate machines. Approximately 5% of patients can be expected to experience adverse drug reactions (ADRs). The most commonly reported ADRs are diarrhoea and headache, both occurring in approximately 1% of patients. Very common (≥1/10); common (≥1/100 to <1/10); uncommon (≥1/1,000 to <1/100); rare (<1/10,000 to <1/1,000), very rare (1/10,000) not known (cannot be estimated from the available data). For all adverse reactions reported from post-marketing experience, it is not possible to apply any Adverse Reaction frequency and therefore they are mentioned with a “not known” frequency. There are no known symptoms of overdose in man. Systemic exposure with up to 240 mg administered intravenously over 2 minutes were well tolerated. As pantoprazole is extensively protein bound, it is not readily dialysable. In case of overdose with clinical signs of intoxication, apart from symptomatic and supportive treatment, no specific therapeutic recommendations can be made. Pharmacotherapeutic group: Proton pump inhibitors, ATC code: A02BC02. Pantoprazole is a substituted benzimidazole which inhibits the secretion of hydrochloric acid in the stomach by specific blockade of the proton pumps of the parietal cells. Pantoprazole is converted to its active form in the acidic environment in the parietal cells where it inhibits the H+/K+-ATPase enzyme i.e. the final stage in the production of hydrochloric acid in the stomach. The inhibition is dose-dependent and affects both basal and stimulated acid secretion. In most patients, freedom from symptoms is achieved within 2 weeks. As with other proton pump inhibitors and H2 receptor inhibitors, treatment with pantoprazole reduces acidity in the stomach and thereby increases gastrin in proportion to the reduction in acidity. The increase in gastrin is reversible. Since pantoprazole binds to the enzyme distal to the cell receptor level, it can inhibit hydrochloric acid secretion independently of stimulation by other substances (acetylcholine, histamine, gastrin). The effect is the same whether the product is given orally or intravenously. The fasting gastrin values increase under pantoprazole. On short-term use, in most cases they do not exceed the upper limit of normal. During long-term treatment, gastrin levels double in most cases. An excessive increase, however, occurs only in isolated cases. As a result, a mild to moderate increase in the number of specific endocrine (ECL) cells in the stomach is observed in a minority of cases during long-term treatment (similar to adenomatoid hyperplasia). However, according to the studies conducted so far, the formation of carcinoid precursors (atypical hyperplasia) or gastric carcinoids as were found in animal experiments (see section 5.3) have not been observed in humans. An influence of a long term treatment with pantoprazole exceeding one year cannot be completely ruled out on endocrine parameters of the thyroid according to results in animal studies. Pharmacokinetics do not vary after single or repeated administration. In the dose range of 10 to 80 mg the plasma kinetics of pantoprazole are linear after both oral and intravenous administration. Pantoprazole’s plasma protein binding is about 98%. Volume of distribution is about 0.15 l/kg. The substance is almost exclusively metabolised in the liver. The main metabolic pathway is demethylation by CYP2C19 with subsequent sulphate conjugation, other metabolic pathways include oxidation by CYP3A4. Terminal half-life is about 1 hour and clearance is about 0.1 l/h/kg. There were few cases of subjects with delayed elimination. Because of specific binding of pantoprazole to the proton pumps of the parietal cell the elimination half-life does not correlate with the much longer duration of action (inhibition of acid secretion). Renal elimination represents the major route of excretion (about 80%) for the metabolites of pantoprazole; the rest are excreted in the faeces. The main metabolite in both the serum and urine is desmethylpantoprazole which is conjugated with sulphate. The half-life of the main metabolite (about 1.5 hours) is not much longer than that of pantoprazole. Approximately 3% of the European population lack a functional CYP2C19 enzyme and are called poor metabolisers. In these individuals the metabolism of pantoprazole is probably mainly catalysed by CYP3A4. After a single dose administration of 40 mg pantoprazole, the mean area under the plasma concentration-time curve was approximately 6 times higher in poor metabolisers than in subjects having a functional CYP2C19 enzyme (extensive metabolisers). Mean peak plasma concentrations were increased by about 60%. These findings have no implications for the posology of pantoprazole. No dose reduction is recommended when pantoprazole is administered to patients with impaired renal function (including dialysis patients). As with healthy subjects, pantoprazole’s half-life is short. Only very small amounts of pantoprazole are dialysed. Although the main metabolite has a moderately delayed half-life (2-3 hours), excretion is still rapid and thus accumulation does not occur. Although for patients with liver cirrhosis (classes A and B according to Child) the half-life values increased to between 7 and 9 hours and the AUC values increased by a factor of 5 to 7, the maximum serum concentration only increased slightly by a factor of 1.5 compared with healthy subjects. A slight increase in AUC and Cmax in elderly volunteers compared with younger counterparts is also not clinically relevant. Following administration of single intravenous doses of 0.8 or 1.6 mg/kg pantoprazole to children aged 2 – 16 years there was no significant association between pantoprazole clearance and age or weight. AUC and volume of distribution were in accordance with data from adults. Preclinical data reveal no special hazard to humans based on conventional studies of safety pharmacology, repeated dose toxicity and genotoxicity. In the two-year carcinogenicity studies in rats neuroendocrine neoplasms were found. In addition, squamous cell papillomas were found in the forestomach of rats. The mechanism leading to the formation of gastric carcinoids by substituted benzimidazoles has been carefully investigated and allows the conclusion that it is a secondary reaction to the massively elevated serum gastrin levels occurring in the rat during chronic high-dose treatment. In the two-year rodent studies an increased number of liver tumours was observed in rats and in female mice and was interpreted as being due to pantoprazole’s high metabolic rate in the liver. A slight increase of neoplastic changes of the thyroid was observed in the group of rats receiving the highest dose (200 mg/kg). The occurrence of these neoplasms is associated with the pantoprazole-induced changes in the breakdown of thyroxine in the rat liver. As the therapeutic dose in man is low, no harmful effects on the thyroid glands are expected. In animal reproduction studies, signs of slight fetotoxicity were observed at does above 5 mg/kg. Investigations revealed no evidence of impaired fertility or teratogenic effects. Penetration of the placenta was investigated in the rat and was found to increase with advanced gestation. As a result, concentration of pantoprazole in the foetus is increased shortly before birth. After reconstitution, or reconstitution and dilution, chemical and physical in-use stability has been demonstrated for 12 hours at 25°C. The reconstituted, or reconstituted and diluted medicinal product should not be refrigerated. From a microbiological point of view, the product should be used immediately. If not used immediately, in-use storage times and conditions prior to use are the responsibility of the user. Do not store above 25°C. Keep the vial in the outer carton to protect from light. For storage conditions of the reconstituted and diluted medicinal product see section 6.3. 15 ml, type I, colourless glass vial, sealed with a grey chlorobutyl stopper and an aluminium flip-off cap, containing 40 mg pantoprazole powder for solution for injection. Pantoprazole 40 mg, powder for solution for injection should not be prepared or mixed with solvents other than those stated. In order to avoid risk of coring during needle insertion through the rubber stopper, a needle with an outside diameter of less than or equal to 0.8 mm should be used during preparation of the solution. This medicine should be administered intravenously over 2- 15 minutes. The content of the vial is for single use only. Any product that has remained in the container or the visual appearance of which has changed (e.g. if cloudiness or precipitation is observed) should be disposed of in accordance with local requirements.